Another seemingly bizarre music choice but while I was a wee boy the voice of Johnny Mathis would be regularly be oozing out of the record player. He was a real favourite of my mum and dad who saw him in concert a few times too. Part of me cannot believe I am writing this but you would be amazed at the level of planning and coordination that goes into Christmas time in a primary school! (unless you already work in a primary school then I am sure you will be nodding your head in agreement) You may have noticed this tweet earlier this week? We also had a staff meeting on Wednesday to discuss the final points of what needed done, by when and by whom. Christmas, though, is another wonderful context for education and this learning and teaching remains as strong a focus at this time of year than at any other. Our staff team are so slick and well organised that I just sat in wonderment as the plans unfolded all around me. Plans are a really important part of life in school and they support every aspect of our work. From individual children’s education plans to teacher’s plans for each curricular area and how they will develop and support the learning of our children. School improvement planning and Cluster Improvement planning with our partner schools and service performance plans from Falkirk Council also keep everyone focussed on improving outcomes for our children alongside the national guidance contained within the national delivery plan for Delivering Equity and Excellence in Scottish Education. Its a fair amount to keep track of and we have pretty robust systems and processes in place to track and monitor our progress every step of the way. You also may have noticed that our Standards and Quality report has been published on our website outlining a snapshot of the success over session 15-16. Very many thanks go to Mrs Guthrie and the rest of the staff team for pulling all of this together. 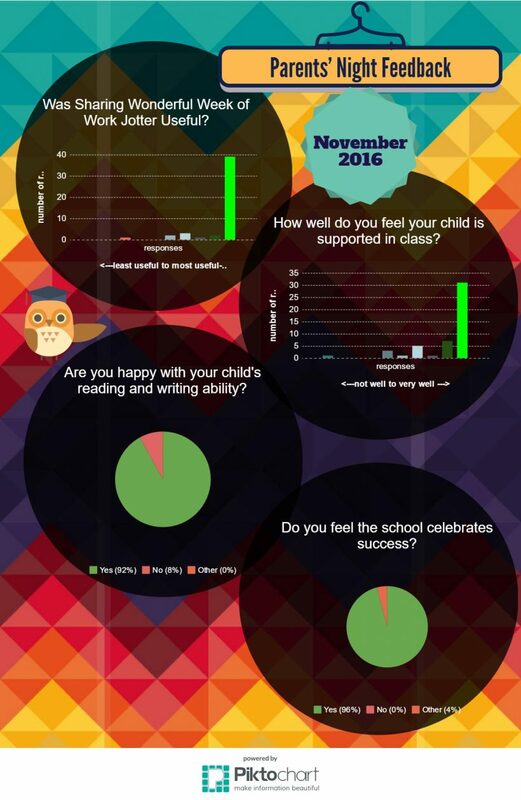 Parental communication is another way in which we monitor the progress of the school and I want to thank all of you who managed along to parents night and took the time to fill in the questionnaire, the results of which I have embedded below.